Today is Part 3 of my series on Freezer basics. Today we are preparing for long term power outages. 1) Get a Generator: If you can afford to, invest in a generator. You don't have to keep your freezer plugged into it constantly,but a few hours every day will keep it cold enough to keep the food frozen through the power outage. 2) Make Large Ice Packs: Fill some empty soda bottles or milk jugs with water and freeze in the days ahead of an impending storm. These jugs can be used both in the freezer and also the refrigerator to keep perishable foods cold. 3) Turn down the Temperature Gauge: If it is not already at the coldest setting, in the days before the storm, turn the thermostat on the freezer. This will slow down the "thaw out" time you have to deal with. 4) Fill up the freezer: A full freezer stays cold longer. The frozen foods act as freezser packs helping to keep each other cold. 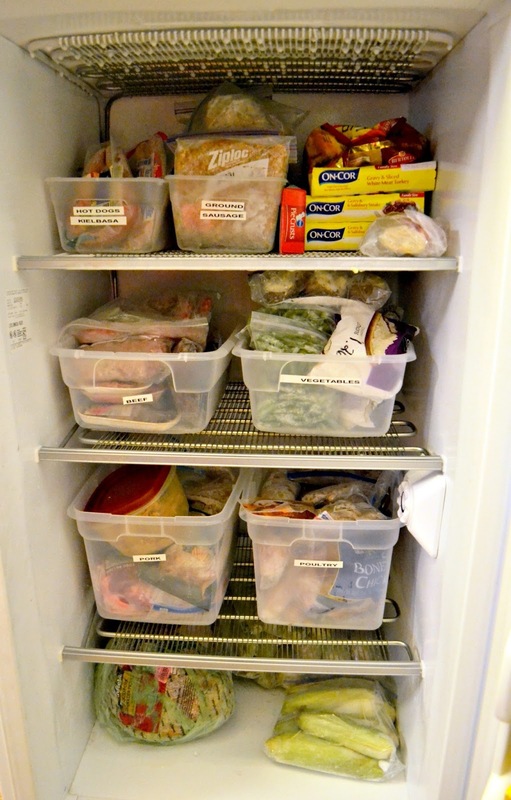 So if your freezer is not full, fill it with freezable items in your fridge (such as cold cuts, cheese, milk, butter) and then fill any extra space with water bottles. (#2 above). 5) Fill the Small Spaces: Buy some drink pouches such as Capri Suns and shove them around the foods and in the small crevices. They'll act as small ice packs. You can drink them after the storm is over. 6) Do the Penny Trick: Place a penny on a frozen cup of water or on an ice cube in an ice cube tray. If the penny sinks to the bottom during the outage, that means that the food in the freezer thawed out too much and can not be refrozen. The food may not be safe any longer. 7) Tape it shut! Grab the duct tape and tape the door shut. (Do the same to your refrigerator!) Habits and curiosity will cause family members to all open and shut the door to check on the food or get something to eat. This lets out way too much of your pressure cold air. Keep it taped shut to avoid this problem. 8) Wrap your freezer: Grab blankets and wrap your freezer so it will have some added insulation. 9) Move it if necessary: If it is outside or in a spot in the garage that gets sun exposure, move it to a shady, cool spot. 10) Stock up on Charcoal or Propane. Be prepared, to cook the meats in order to attempt to save them. Have a party with friends and cook all the meats to have an interesting potluck dinner. It'll make a fun evening in difficult circumstances while trying to salvage your food investment.